The first place winning proposal, by Yingzhe Duan, uses offal — sheet metal left over from car manufacturing — in its perforated skin system. 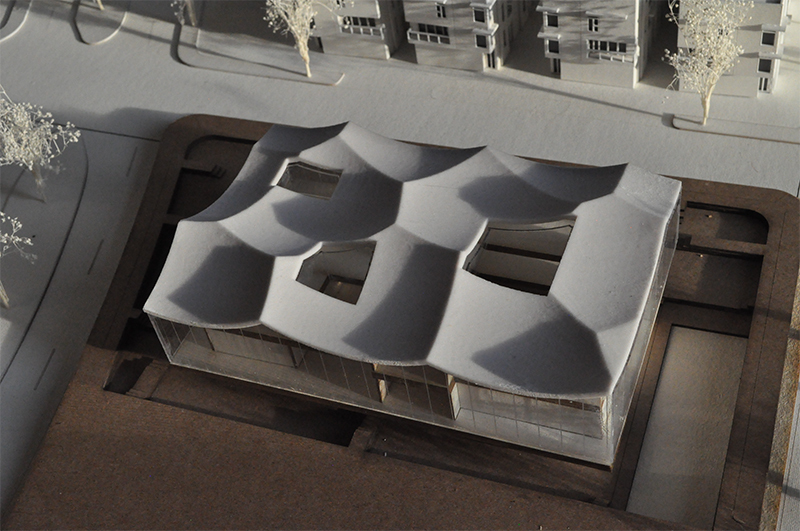 The swooping forms of the roof are reinforced concrete. 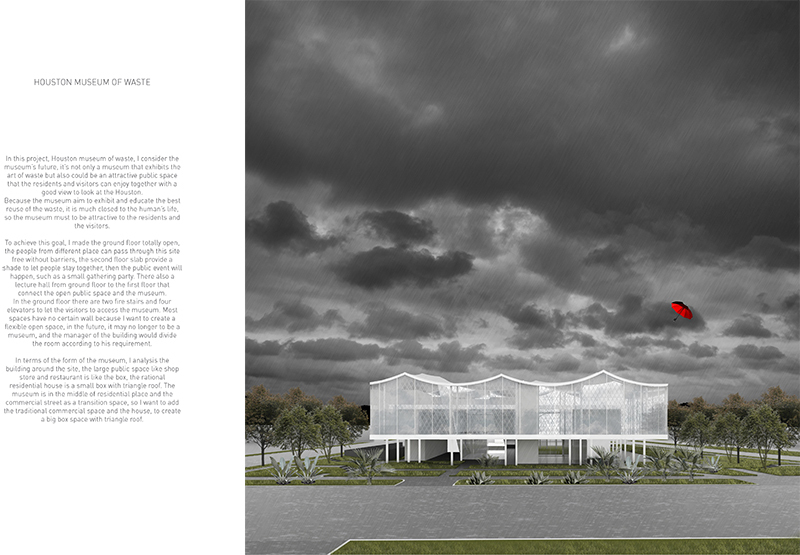 The competition’s runner up, by Panwang Huo, is described as “a serious attempt at making poetry from trash.” It uses the offal to create a screen on the facade that opens and closes to modulate light and air on the interior. Image by Panwang Huo. The Texas A&M University College of Architecture organized a student design contest in Fall 2016, seeking uses for the standardized waste products produced by the auto manufacturing industry. 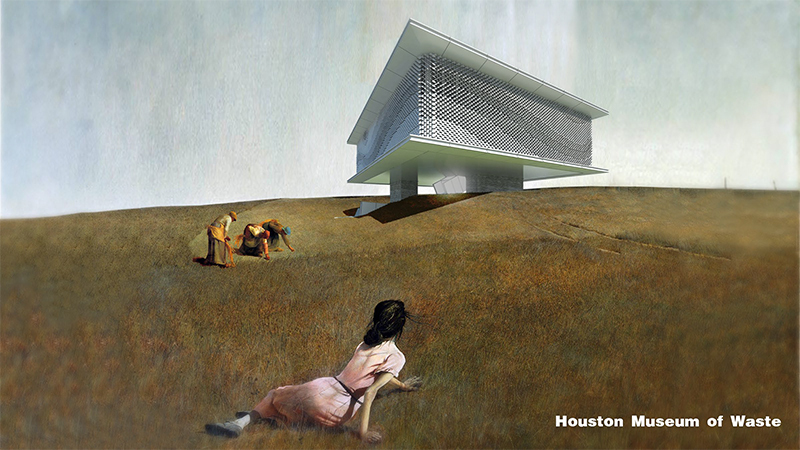 The competition brief tasked students with putting scrap sheet metal to use in designing a Houston-based Museum of Waste. The museum would be small, less than 30,000 sf, and dedicated to explaining how design can help reduce waste. Working in partnership with General Motors, the students were provided with information about the tremendous amount of scrap sheet metal — known as offal — that is produced from stamping out car parts. John Bradburn, GM’s Global Waste Reduction Manager, served as one of the members of the jury, along with chair Ryan Jones, AIA, an associate partner at Lake|Flato Architects; co-chair Kendall Clarke, an intern at Corgan; Gary Davis, director of marketing at Zahner; and Andrew Mangan, executive director of the U.S. Business Council for Sustainable Development. TAMU Assistant Professor of Architecture Ahmed Ali organized the competition and has plans for many more. “I think there is a lot of benefit to the profession and also to the students to raise their independent thinking through an annual competition,” he says. The concept is striking and I applaud the student for winning this contest. However, what this resulting design signals to me is that architecture schools are failing to teach its students to care about the human form and human experience at the street level. As with this design, these large-scale projects look great from the perspective of a bird or plane, but are almost entirely inhospitable to people at the sidewalk. This has been true since the mid-20th Century since we started caring more about the skyline than our eyeline. We have got to do better than this.